It's no secret, raising a kid is hard. Raising a child with a disability, adds an entire level of extra stress. Having a child with an impairment that is rarely discussed, with limited resouses, is beyond the worst! 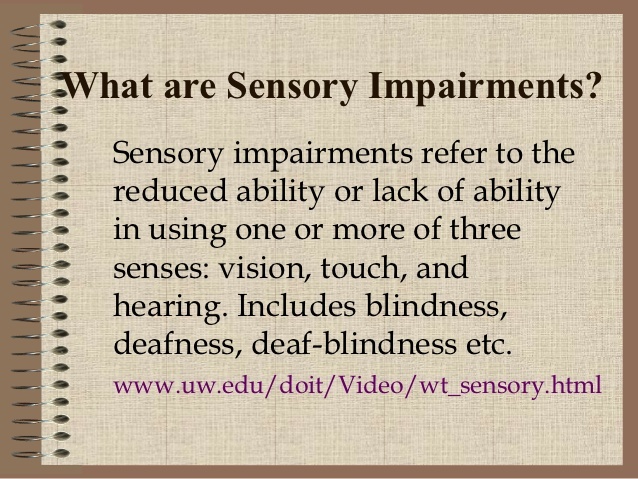 One disability or impairment that is hardly ever talked about is sensory impairments. Some children are born with this, while others develop it over time. Just like with Autism, Sensory Imparment involves a wide spectrum encompassing all the senses. Something as simple as getting dressed in the morning, can be an incredibly stressful experince for a child suffering from a sensory disability that involves touch. The child will experinces a much higher sensitivity to touch, or the way something feels, than you. Many perents find something as simple as the seam in a sock, will make it feel impossible for the child to wear. If this is you, it may be a good idea for a parent to invest in something like seamless socks for kids. Changing small things to make your child more comfortable will make their life easier for all involved. The hard part is figuring out what those changes need to be. This may take more time and patience than you think you have, but you're a parent, of course you can do it! It's What you do as a parent that matters, this crazy effort you're putting in now, will ensure your child can independently succeed. 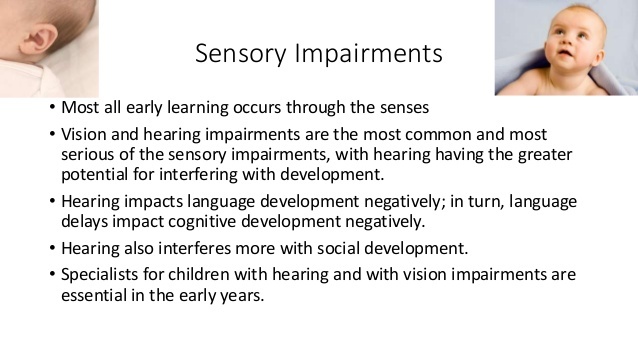 There are three main types of sensory impairments; however, the list is not limited to the following disorders. 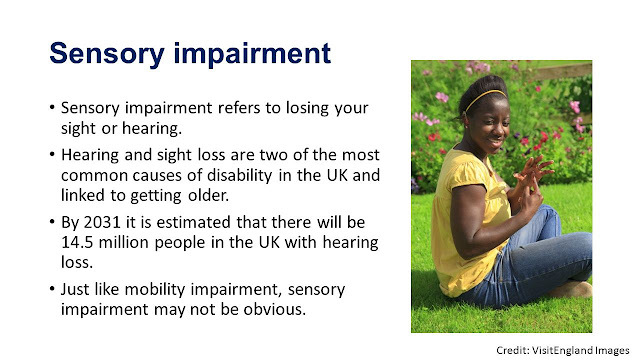 The most common sensory impairment is blindness. Blindness can express itself in many ways. Some people may have central vision loss, peripheral vision loss, contrast impairment, a glare, reduced depth perception or a blur. Blindness and low vision may occur due to the result of an infection, condition or accident. Thankfully, the majority of people who are blind are able to live a mostly independent life. This is due to the many innovations of technology. With braille, people who are blind can read. Animals like guide dogs can help the blind navigate around and there are many surgeries that can fix some causes of blindness. Another form of sensory impairment is hearing loss. Hearing loss can be expressed as partial or total inability to hear. There are many ways a person may develop hearing loss. For example, a person may develop a hearing impairment from genetics, aging, exposure to noise, illness, chemicals and/ or physical trauma. Due to increased technology, people with hearing loss or total deafness are able to live completely normal lives. For instance, people are now able to express themselves through sign language, as many schools are now teaching it. Hearing aids help some people with partial hearing loss hear again. On top of this, cochlear implants are able to function as the damaged parts of the inner ear, allowing once deaf people to hear. The last type of sensory impairment is very common throughout the world, Autism Spectrum Disorder. This disorder is a lifelong developmental disability. Autism can cause a person to have a difficulty with social interaction and communication, along with many sensitivities to normal sensory experiences. Examples of sensitivities caused by autism may be to noise, light and touch. Symptoms of autism are often also seen as repetitive behaviors with a limited interest in activities. Sensory processing disorder is also highly connected to people with autism. This is a condition in which certain sensory signals are inhibited from being received or perceived by the brain correctly. When these signals aren’t interpreted correctly, it can lead to issues such as motor clumsiness, anxiety, depression, learning disabilities and behavioral problems. There are many tools that are available for parents of kids with autism. There are large amounts of prescription medications that can help a child that is developing with autism. Thankfully, there are also other ways to reduce the number of difficulties by helping your child learn new skills and by helping them find and use their strengths. Many schools have programs to specifically cater to your child’s developmental and social needs. These schools provide many children the opportunity to learn how to process some of the senses that are affected by this disorder. Every child with a sensory impairment is different, so it is important to know that one approach may work for someone else, but not for your specific family. It is important to be patient while working alongside doctors in order to find the best approach to treating your child’s specific needs. While you figure out what works for your family and what doesn’t work, continue to research and stay in tune with new innovations and technologies.